Planning a camp or conference for summer 2019? Have interns/researchers assisting your college or department this summer? Stay on campus with Residence Life! Residence Life has on-campus housing all over campus including our newest facility, White Creek Apartments near West Campus, our state-of-the-art residence hall, Hullabaloo Hall near the Northgate District and the newly-renovated Commons residence halls on the Southside of campus. 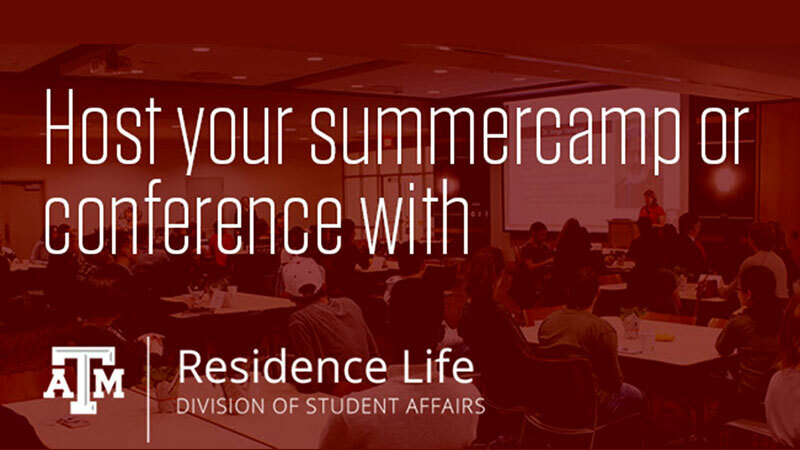 The Conference & Guest Services Team from Residence Life is dedicated to providing your summer camp or conference a successful on-campus experience tailored specifically for your group’s needs while exploring Aggieland! Explore availability, summer rates, and register at Adult & Youth Conferences online. If you still have questions, please contact us at 979.845.1279 or Conference-Services@housing.tamu.edu.